This Easy Homemade Pink Lemonade Recipe is full of fresh, fruity summer flavours! A step by step video shows you how to make pink lemonade — perfect for Spring birthday parties, baby showers, or a 4th of July cookout! 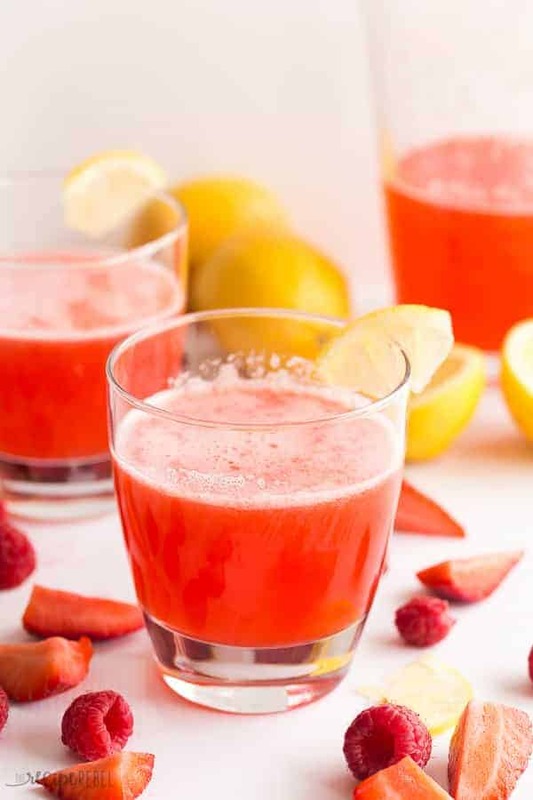 Make a strawberry lemonade, raspberry lemonade, or use a combination of summer berries! Friends, the amount of summer drink recipes I have here on The Recipe Rebel…. it’s just embarrassing (if you’re into embarrassing, check out the photos on these Roasted Strawberry Rhubarb Milkshakes — and then go make them. ‘Cause they’re delicious). But every now and then (say for example, your oldest baby girl is turning 6 in just a couple weeks! ), you just want something a little special. Homemade Pink Lemonade to the rescue you guys. My daughter loves pink, and berries, and lemon everything, so this had to happen just for her. It’s such a fun colour for a girl’s party or baby shower! If you’ve never done any research on the origins of pink lemonade, you probably shouldn’t. Apparently dirty wash water and red hot cinnamon candies may have caused the festive colour, though you won’t find any of that around here! Fresh and fruity and delicious is what we’re going for. Around here, I consider myself lucky because the hubs and all of my girls love lemon and citrus flavours. I know growing up I hated lemon (how is that even a dessert?! ), but I think I now prefer it even over chocolate! But even though I love all things punchy and tangy, I’ve always preferred pink lemonade over plain Jane because the berries tame down that sour lemon flavour just enough. You can serve it with regular water or sparkling water, add in other fruit flavours (feel free to get a little crazy here! Strawberry Kiwi? Blueberry? ), or mix it up with half iced tea for a fun twist. Pick the best lemons — they’re the star here so make sure you get lemons that are firm but not hard, slightly heavy, with bright yellow skin and no wrinkling. It’s important that they give a little when you squeeze them, because those will give you more juice, which is what we need here! Get creative with your fruit — I use a combination or strawberries and raspberries, but you can use one or the other, or neither! This is a recipe where the rules are meant to be broken. Come up with your own concoction simply by swapping out the fruit puree! Got leftovers? Pour it into an ice cube tray to flavour iced tea down the road, or pour it into popsicle mold for a refreshing treat down the road! When you’re done with the recipe, the flavour is going to be very concentrated. It is super easy to add as much or as little water or club soda or ice as you like to get the strength you desire! This Easy Homemade Pink Lemonade Recipe is full of fresh, fruity summer flavours! A step by step video shows you how to make pink lemonade -- perfect for Spring birthday parties, baby showers, or a 4th of July cookout! 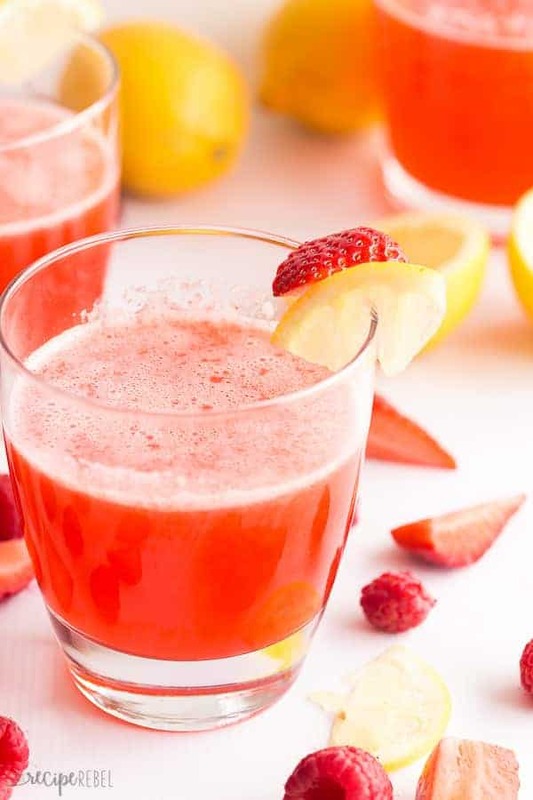 Make a strawberry lemonade, raspberry lemonade, or use a combination of summer berries! To a medium saucepan over medium-high heat, add water and sugar. Bring to a simmer and whisk until sugar is dissolved. Add lemon peel strips, bring to a simmer, and cook for 5 minutes or until mixture is reduced by almost half. Set aside to cool slightly. Place a fine mesh sieve over a pitcher. Pour the lemon syrup through the sieve into the pitcher, followed by the lemon juice, strawberry puree, and raspberry puree. You may have to use a spatula to stir the liquids around and press through, but it will work. Serve with desired amount of water, club soda, and ice cubes (roughly 2 cups). « BBQ Instant Pot Chicken Thighs: from FRESH or FROZEN! 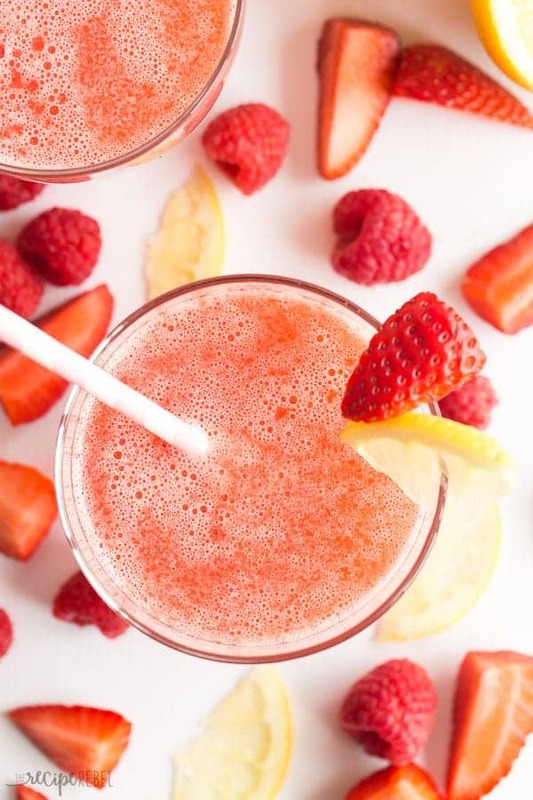 This looks incredibly refreshing and delicious! I loved the addition of raspberry puree in this recipe, I’ve only ever made it with strawberries. Now, I’ll never go back. This will be my go-to recipe going forward. Sounds like such a refreshing treat for those hot summer days ahead! I can’t wait to try this for our next party or get together!